TERMINATOR 2 COMPLETE LED Lighting kit. TERMINATOR 2 Custom Complete LED Lighting Kit contains all LED bulbs needed to change out incandescent bulbs for a full LED playfield, GI, backbox and ALL flasher bulbs. T2 Custom complete LED Kit includes color specific bulbs with placement charts for both playfield and backbox. All #555 and #44/#47 bulbs are Super Bright Quad 4LED bulbs and all #89 and #906 are Ultra Bright 8LED Flasher bulbs. 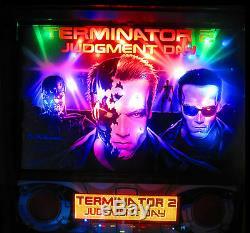 Listing Includes: TERMINATOR 2 LED Lighting Kit (Pinball Machine NOT included). The item "TERMINATOR 2 Complete LED Lighting Kit custom SUPER BRIGHT PINBALL LED KIT" is in sale since Tuesday, April 17, 2018. This item is in the category "Collectibles\Arcade, Jukeboxes & Pinball\Pinball\Machines". The seller is "pinbulbzandarcades" and is located in Clinton Township, Michigan. This item can be shipped worldwide.